Nerves of the face. The facial nerve (motor) is depicted in green, the branches of the trigeminal (sensory) in black. 1. Temporal branches. 2 and 3. Zygomatic branches. 4 Buccal branch. 5. Mandibular branch. 6. Cervical branch. 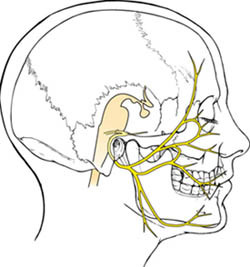 Simplified diagram of the facial nerve (yellow). The facial nerve is the seventh cranial nerve (VII). It arises from the pons and medulla oblongata (parts of the brainstem) and leaves the posterior fossa of the skull by entering the interior auditory meatus on the inner aspect of the temporal bone with the eighth cranial nerve (the auditory nerve). After a winding course, it leaves the skull through the stylomastoid foramen, in front of the mastoid process. After emerging from the stylomastoid foramen, the facial nerve curves forwards round the lateral side of the styloid process and internal jugular vein, sinks into the posteromedial surface of the parotid gland. Before it enters the gland it gives off: (1) the posterior auricular nerve, and (2) a branch that divides into two twigs to supply the stylohyoid muscle and the posterior belly of the digastric. 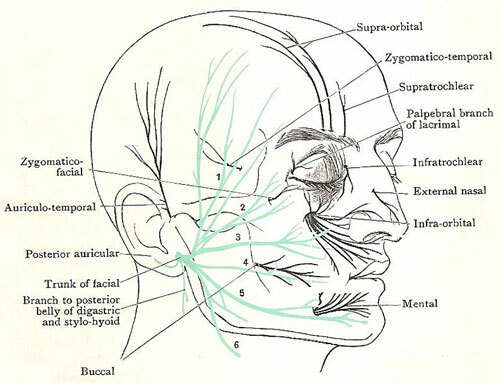 As it passes through the parotid gland it divides into five branches or sets of branches – temporal, zygomatic, buccal, mandibular, and cervical. They pass forwards radiating from one another, and receiving communicating branches from the great auricular and the auriculotemporal nerves; and they emerge through the deep surface of the gland near its ends and anterior border. The facial nerve performs both motor and sensory functions. It controls the muscles of the neck and of facial expression (including muscles in the forehead); it also stimulates secretion by the submandibular and sublingual salivary glands. In addition, the facial nerve conveys taste sensations from the front two thirds of the tongue and carries sensations from the outer ear. A small branch to the middle ear regulates the tension on the auditory ossicles. Paralysis of the facial nerve, causing weakness and loss of function of the muscles it serves, results in facial paralysis. It occurs in Bell's palsy. The commonest cause is infection with the herpes simplex virus.